Posted by GayPatriotWest at 10:29 pm - September 4, 2008. Senator, I can’t either. That introduction can’t come soon enough. “What you fight for is the real test.” He may not be as good as speaker as Obama, may lack his mellifluous voice, but so far, this is a far better speech, far better focused, far more gracious than his rivals. And far more heartfelt. It’s not as if his repeating some mantra or rehashing his party’s ideological creed, this man is speaking from his heart. He believes what he’s saying. I am enjoying this speech. Would rather listen than blog. Perhaps I should have taken the opportunity to sit in the stands and listen, but I would not have been able to use wireless there. He’s talking as a confident leader, strong and self-assured. I’m glad I followed my gut when I voted for him in the California primary. Again and again, I’ve worked with members of both parties to fix problems that need to be fixed. That’s how I will govern as President. I will reach out my hand to anyone to help me get this country moving again. I have that record and the scars to prove it. Senator Obama does not. The new politics Barack Obama talks about is the kind of politics John McCain has practiced throughout his career. It was a good speech, not quite Palin, but better than Obama. And cool it is to watch the balloon drop from above. And there’s more to come. I can still see them in the rafters. Posted by GayPatriotWest at 10:24 pm - September 4, 2008. He begins with gratitude . . .
Posted by GayPatriotWest at 10:18 pm - September 4, 2008.
. . . and acknowledgement. Posted by GayPatriotWest at 10:16 pm - September 4, 2008.
. . . as John McCain enters the auditorium. 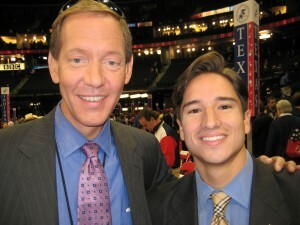 Everyone goes wild as he accepts the Republican nomination. And the chant continues. Posted by GayPatriotWest at 10:08 pm - September 4, 2008. Once again you can feel the energy in the auditorium, but it’s a different of energy than yesterday. At 96, John McCain’s Mom looks great, having a tarter tongue and expressing herself more readily and honestly than some men than half her age. Is this the first image of a Republican presidential nominee with Richard Nixon featured at the RNC convention since Nixon himself was the nominee in 1972? Even the site staff are watching the speech; we’re transfixed. . . .
Wonder how many left-wing bloggers will fault John McCain for using his biography in this introductory video . . . .
How to Cover the Speech? Posted by GayPatriotWest at 10:04 pm - September 4, 2008. Trying to figure out if I’ll do a few short posts like last night or kind of live blog, but I learned that Obama finally appeared on the O’Reilly Factor, but today. This shows how pathetic and classless both men are. Both should have shown respect for American political tradition and left the day to the Republican nominee. But, at least we know almost as many people watched the Republican Vice-Presidential nominee as watched the Democratic Presidential nominee. Posted by GayPatriotWest at 9:50 pm - September 4, 2008. I just returned to the nosebleeds to cover McCain’s speech; I was debating watching with the Ohio visitors, but decided I wanted to watch the crowd below. I will miss the camaraderie I had this afternoon and for most of this convention when I hung out with Pajamas folk by the Pajamas TV booth. Â So cool talking to such great bloggers whom I have heretofore primarily known as pixels on a screen. As I was setting myself up, I heard Cindy McCain praise her husband’s running mate as “pistol-packing mother.” Â The media surely winced, but people across America certainly smiled at a woman politician to whom they can relate. Posted by GayPatriotWest at 7:54 pm - September 4, 2008. Judy Davidson was delighted to model her hat for me so I could make the convention complete. 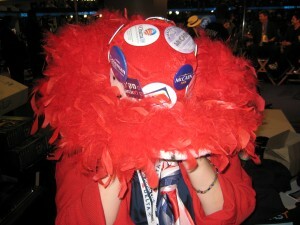 Because without a funny hat picture, you haven’t really covered a political convention. Posted by GayPatriotWest at 5:58 pm - September 4, 2008. I just cut two interviews for Pajamas TV, one in Pajamas booth where I have pretty much based myself one from Pajamas booth and the other from the convention floor. It was quite a feeling to be there on the floor, seeing the various delegates and the countless reporters, many interviewing those delegates, others chatting with their colleagues. After I participated in an interview with openly gay Lone Star State alternate delegate Carlos Obando of Houston, that fetching Texan and I walked over and introduced ourselves to Carl Cameron of FoxNews with whom we shared our perspective as gay Republicans. Posted by GayPatriotWest at 4:41 pm - September 4, 2008. 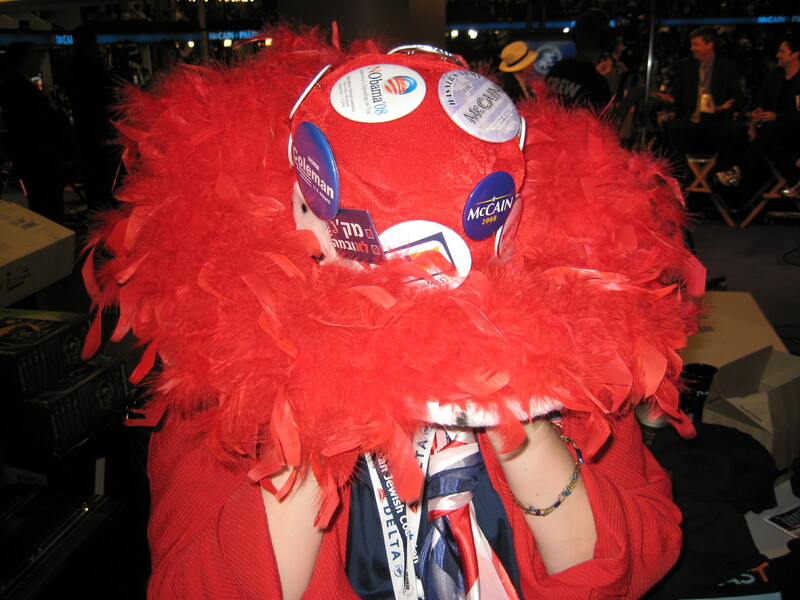 On the fourth day of the 2008 Republican National Convention, we at GayPatriot are celebrating our fourth blogiversary. And Sarah Palin has helped make this day all the more special for all we here at GayPatriot and for all gay patriots. Bruce, this dirty martini‘s for you. Â It’s really quite something you accomplished when you set up this blog. I repeat, Bruce Carroll, I am in your debt. Posted by GayPatriotWest at 2:20 pm - September 4, 2008. Just moments ago, here at the Chambers Hotel in downtown Minneapolis, McCain campaign strategist Steve Schmidt briefly addressed a Log Cabin Republicans honoring the gay delegates to the Republican National Convention. I don’t think he’ll find any disagreement from GayPatriot readers. That Schmidt showed up today puts truth to the lie we hear all too often from our critics that gay people aren’t welcome in the GOP. This is truly a Big Tent party, with the McCain Campaign reaching out to gay Republicans as well as evangelicals. UPDATE: Â The Advocate picked this up as well.